Users may often encounter the problem of failing to import FLV to Adobe Premiere like the one who asked for solution mentioned above. Never mind, after discussing why you can’t import FLV to Adobe Premiere, there comes the way for how to convert FLV to Adobe Premiere to fix the problem. Part 1. What is Adobe Premier Pro? Adobe Premier Pro is a stunning and popular tool for video editing. Besides, it can also be used for graphic designers and photographers to easily edit videos and graphics in their native form. What’s more, it works with a large number of video formats, such as 3GP, 3G2, ASF, AVI, DV, F4V, GIF, M1V, M2TS, M4V, MOV, MP4, MPEG, MPE, MPG, M2V, MTS, VOB and WMV, etc. However, there is an unsupported compression type—Adobe Premiere Pro does not support importing FLV files directly. You should convert FLV to Adobe Premiere supported formats before you import FLV to it. And FLV to Adobe Premiere converter will provide users with great help. As the best and most popular video converter software, Leawo Video Converter empowers users to convert video files contained in more than 180 formats from one to another, including the common video files input like MP4, AVI, MOV, MKV, MTS, FLV, etc., and output like MP4, H.265 MP4, MKV, H.265 MKV, MOV, HD Video and 4K Video, etc. 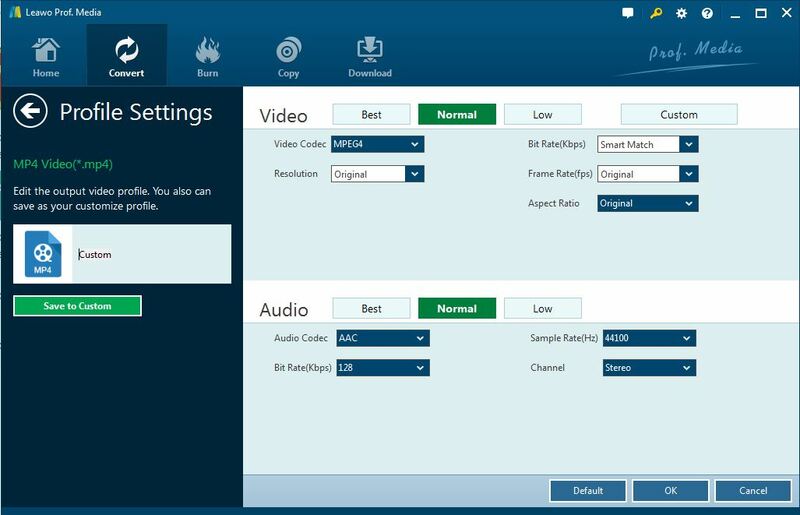 It means Leawo Video Converter can help users to get video files in any video files. Additionally, it can work fast in 6X high speed and keep the original quality of the video during the converting. Thus, it can also convert FLV to Adobe Premiere supported formats easily and efficiently as FLV to Adobe Premiere converter. Similarly, it can also convert FLV to Final Cut Pro, iMovies, Chromebook, Chromecast and so on. After you download and install the converter, you can launch it and follow the guide below to convert FLV to Adobe Premiere. Click “Add Video” to import the video file in FLV format to the program, or you can directly drop or drag the FLV video to the program. Note: you can make several video files into one with the function of “Merge all files into one”. After the source video imported, click the drop-down box next to the green “Convert” and choose “Change” button to enter the Profile Panel where you select MP4 as the Output format. Back to the drop-down box, click the “Edit” option to enter the “Profile Settings” interface to set parameters for the selected video, including: Video Codec, Quality, Video Size, Bit Rate, Frame Rate, Aspect Ratio. Remember to click “OK” to save your settings. After setting parameters, you should return to the main interface and click the big green “Convert” button. Then a sidebar pop up, you are required to set a directory for containing output video files in the “Save to” box. Click the “Convert” icon at the bottom of the sidebar to start converting FLV to Adobe Premiere supported MP4. The process will be finished soon and you can import FLV to Adobe Premiere as you want then. When the converter software finishes the FLV to Adobe Premiere supported MP4, you could find the output video file where you saved and import the video to Adobe Premiere as you like. Except for the converter software solution, there is also the Files-Conversion, a free FLV to Adobe Premiere online converter for converting FLV to Adobe Premiere compatible formats. It provides you a free service to convert any format, such as 3GP to AVI or WMV to FLV, FLV to MP4, etc. You can even set the output quality as well. And it is easy to be used for any users, too. You can follow the simple steps here for FLV to Adobe Premiere. STEP 1: Select the FLV file you want to load to the site and convert into Adobe Premiere. STEP 2: Select the output Format you prefer, here we choose MP4 for example. STEP 3: You can set the quality you prefer and you can choose the output size of the video in the Size box. STEP 4: Click “Convert” to start converting FLV to Adobe Premiere compatible format MP4. It will work at once and finish the converting in some times due to the size of the video file. Anyway, it will simply work itself and you can get the converted video in MP4 and import the video to Adobe Premiere as you like. Since we have known the kinds of solutions here, Leawo Video Converter and the File-Conversion online, it is necessary for you to know the difference between the two FLV to Adobe Premiere converters. 1. Application software installed in the PC. 2. Offering video editing service that users can trim, crop, watermark the video, and even convert the video from 2D to 3D. 3. Supporting over 180 formats including video and audio formats. 1. Online converter actually working in the converting site. 2. Offering the service of video size setting. 3. Supporting common video formats and several audio formats. Original quality reserved and parameters setting available. Quality saved in different resolution, including Low, Moderate, High and Very High. Free for trial, low cost in upgrading. To sum up, they both have some great merits and could offer you the proper solution for FLV to Adobe Premiere. The FLV to Adobe Premiere converter – Leawo Video Converter offers you the great enjoyment in converting FLV to Adobe Premiere with its great features and Files-Conversion gives you the platform to convert FLV to Adobe Premiere for free and without installing any software to occupy your space in your PC. However, the privacy and convenience will be brought to you with the Leawo Video Converter. Just feel free to choose the best one suits you better.